This review of Lamisil Athlete’s Foot Cream is to help prospective customers buy the right product for the treatment of athlete’s foot. The information that is provided will help a customer make an informed decision. 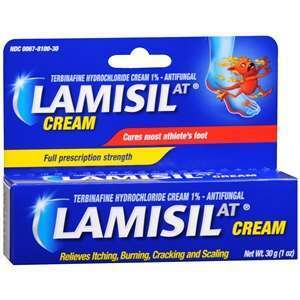 Lamisil Athlete’s Foot Cream helps in relieving itching, burning, cracking, and scaling associated with jock itch, athlete’s foot, ringworm, and other fungal infections of the skin. It works by killing sensitive fungi. The product is available on online shopping websites and not on its website. Read on to know more about which active ingredient treats this infection and whether the product is good enough to treat Athlete’s Foot. One should wash the affected area with soap and water and be sure the area is completely dry before applying the cream. Apply a thin layer of cream and rub in gently as directed by your doctor or the package labeling. One should make sure that the product is applied to the spaces between the toes. Wear well-fitting, ventilated shoes and be sure to change your socks at least once a day. Wash your hands immediately after using the cream unless your hands are part of the treatment. To clear up your infection completely, use the cream for the full course of the recommended treatment. Keep using it even if you notice an improvement after a few days. Between the toes only: Apply twice a day (morning and night) for 1 week or as directed by a doctor. On the bottom or sides of the foot: Apply twice a day (morning and night) for 2 weeks or as directed by a doctor. For jock itch and ringworm: Apply once a day (morning or night) for 1 week or as directed by a doctor. The product is priced at $13.90 and the price information is available only on other shopping websites and not on the product’s website. There is no guarantee being provided by the manufacturer however they have provided a number for customers to call and address their problems and issues related with the product. The customer reviews are available on both the product’s website as well as on the shopping websites and they are positive and encouraging. Lamisil Athlete’s Foot Cream is a good option for the treatment of athlete’s foot and is backed by strong customer reviews which help a prospective buyer in making a wise decision. It contains the active ingredient Terbinafine Hydrochloride which helps treat the infection and does not cause any harm to the skin. The instructions on how to use it and the list of ingredients are clearly mentioned on the website. However, there is no manufacturer’s guarantee when it comes to this product. There is a warning for pregnant women to consult their doctors before using this product as it is believed that the ingredients once absorbed by the skin can enter the blood stream and cause side effects in pregnant women. The bottom line is that the product is safe to use but it is advisable to consult a doctor to prevent any future complications. Jimmy Rodriguez	reviewed Lamisil Athlete's Foot Cream	on November 19th	 and gave it a rating of 2.5.